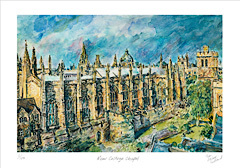 New College was founded in 1379 by William of Wykeham, Bishop of Winchester, and was known as the ‘St. 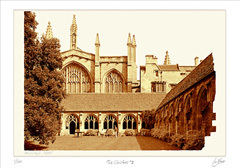 Mary College of Winchester in Oxford’. Building was started on land just inside the north walls of the city in 1380. 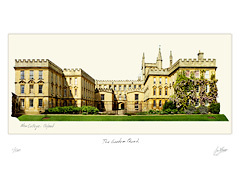 The college is a model for collegiate architecture as for the first time a college in Oxford was designed as a single group of buildings. The master mason William Wynford is credited as responsible for the design. The Holywell Buildings outside the old city wall are known as the ‘New Buildings’ as they were not built until 1872 by the architect Gilbert Scott. They were originally intended to have only three storeys but to house the increasing numbers of undergraduates a fourth storey was insisted on. 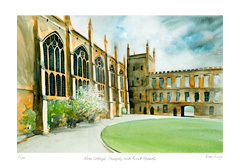 The five storey tower to the west, containing two more staircases and a married tutor’s house, was added in 1875. The niches on the tower hold statues of Edward III, Richard II and Henry VI. In 1883-97 the buildings were extended by Basil Champneys who added the Robinson Tower and the three storey buildings to the east of the tower known as ‘Pandy’.